In the Gospel, Jesus extends a paradoxical invitation: Take up a “yoke” to find rest. What did He mean? Today’s reading is best understood in its context within Matthew’s Gospel. In the preceding verses, Jesus upbraids some of the cities of Galilee for refusing to repent and believe in Him as Israel’s Messiah, even though they had seen Him perform many “mighty works.” Their proud resistance to Jesus, the carpenter’s Son, brought them spiritual blindness. Because He had revealed so much to them without a response of repentance and faith, He warned them: “…it shall be more tolerable on the day of judgment for the land of Sodom than for you” (Mt 11:24). It was “at that time” that Jesus turned to His Father with praise and gratitude: “I give praise to You, Father, Lord of heaven and earth, for although You have hidden these things from the wise and learned, You have revealed them to little ones.” Jesus here contrasts the “wisdom” and “learning” of the religious leaders of the people, the scribes and Pharisees, to the simplicity of “little ones.” Opposition to Jesus always came from the ones who prided themselves on their knowledge of Scripture and the tradition of the Jews in the Mosaic Law. Their knowledge, sadly, didn’t lead them to humility. The power they derived from their privileged positions corrupted them, so much so that Jesus once told the people: “The scribes and the Pharisees sit on Moses’ seat; so practice and observe whatever they tell you, but not what they do; for they preach but do not practice. They bind heavy burdens, hard to bear, and lay them on men’s shoulders; but they themselves will not move them with their finger” (Mt 23:2-3). The Law of Moses was meant to be a joy for God’s people, showing them the path to life. It was to be an escape from sin, into which all of us are born, that was even more liberating than their escape from physical slavery in Egypt (see CCC 2057). However, through pride and hard hearts, the “wise” and “learned” manipulated and added so much to the Law that it became a crushing burden on the very people it was meant to free. 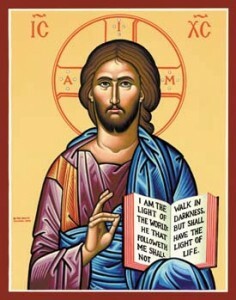 Jesus says He will be the One to reveal God to those seeking Him, but not in an arbitrary, selective way: “Come to Me, all…” His invitation to share the intimate knowledge of the Father that is His through Sonship goes out to all who have the humility to accept it. Jesus knew that religion that did not lead to a relationship with God left its practitioner with a heavy burden—the weight of his own sin, as well as the unfulfilled longing of his heart to know his Creator. To that weary soul, Jesus promised rest, but in a paradoxical way. The rest would not come in cessation of activity but in taking on the “yoke” of Jesus. A yoke always forms a communion—a farmer yokes an animal to a plough, and together they dig up the soil. One animal is yoked to another, and together they share the burden of the work. When we take the yoke of Jesus upon ourselves and learn from Him, we discover that He has perfectly fulfilled God’s Law for us. As St. Paul tells us, Jesus “emptied Himself, taking the form of a servant, being born in the likeness of men…He humbled Himself and became obedient to death, even death on a cross” (Phil. 2:7-8). When we are yoked to Jesus, we are yoked to His humble obedience. At long last, we “find rest” for ourselves. We are no longer alone. The yoke of Jesus, although it requires self-denial, is “easy” and His “burden light,” because we share it with Him. Who would turn down an invitation like this? Possible response: Lord Jesus, I have often made my burdens in life heavier by trying to bear them alone. Help me yoke myself to You today. Zechariah was a prophet during the time when a remnant of Jews who had been in exile in Babylon (punishment for their serious covenant unfaithfulness) were allowed to return to Judah and to re-establish the life they had lost as God’s people (about 520 B.C.). Zechariah sought to stir up desire and commitment to re-build the Temple in Jerusalem, the center of religious life. Through him, the LORD gave prophetic visions of a future Messianic king who would rule over a restored kingdom of David. This prophecy helps us understand why Jesus, hundreds of years after it was written, would describe Himself as “meek and humble of heart,” offering “rest” to the weary. The humble Messiah had finally arrived, and only the humble could “see” Him. Possible response: Lord Jesus, help me remember that victories in Your kingdom are won through humility, not might. St. Paul gives us a practical application of what happens in our lives when we respond to Jesus’ call to take His yoke upon ourselves. The “rest” He offers is our “rest” from the weight of sin. St. Paul tells us that, as believers, we now have God’s own Spirit living in us. The work of the Spirit is to free us from the death-producing power of our “flesh.” St. Paul uses this term to describe the sin that seeks to rule us as we dwell in our mortal bodies (concupiscence). Our bodies, made in God’s image and likeness, are good, but our rebellious self-love always tries to subvert them. Jesus’ victory over sin, death, and the devil means that believers, through baptism, have the gift of the Holy Spirit to disrupt and destroy the power of sin over us. That is why Jesus said, “My yoke is easy, and My burden light” in our Gospel reading. As St. Paul says, the “yoke” of Jesus will mean death to our flesh—mortification—but we are not alone in this work of liberation. The Spirit enables us to “put to death the deeds of the body” so that we “will live.” The heavy mastery of our own sin over us, experienced as our crushing inability to be the people we know we ought to be, is now broken. Finally, we can find rest. Possible response: Holy Spirit, help me do battle with the self-love that so easily besets me. I know all it can offer is death.